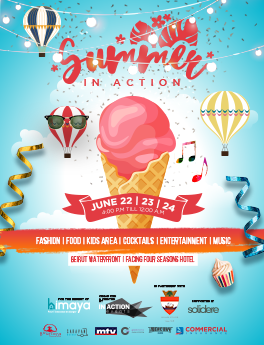 People from all over the country flocked to our Summer In Action event at Beirut Waterfront on the 22nd, 23rd, and 24th of June 2018. People enjoyed the evening breeze with food stalls, shopping stands, a giant kids area and entertainment for all ages! Performers such as Nour Nemri, Les Croquenotes, Samar & Afif, Teshwish, Ingrid Naccour, Bruno Tabbal, and many more took the stage, with Ghinwa's Dragon de Chine to mistify children at the event.